The tobacco mosaic disease is caused by a rod-shaped virus called as TMV. TMV stands for Tobacco Mosaic Virus. It causes disease in Tobacco plant. It is a single stranded RNA virus with rod shape as you can see in following picture. It is about 300 nm long and 15 nm in diameter and consists of a single strand of RNA protected with a capsid formed of protein sub-units. Its capsid is made from 2130 molecules of coat protein and one molecule of genomic single strand RNA 6400 bases long. 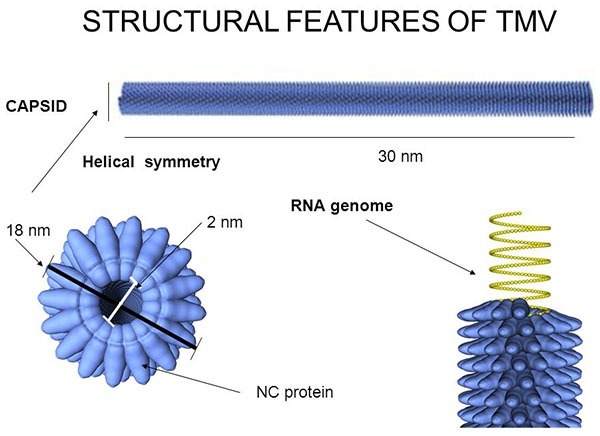 The coat protein self-assembles into the rod like helical structure (16.3 proteins per helix turn) around the RNA which forms a hair pin loop structure. The protein monomer consists of 158 amino acids which are assemble into four main alpha helices. Each subunit consists of 158 amino acids arranged in a helix. 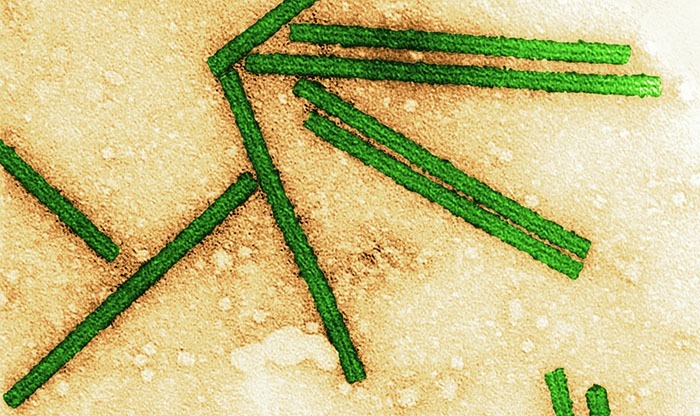 TMV is one of the most thermostable virus known so far. It can withstand a temperature as high as 93° C.
It is known to infect members of nine plant families especially solanaceae and at least 125 individual species, including tobacco, tomato, pepper, cucumbers, end a number of ornamental flowers. The first symptom of this virus disease is a light green coloration between the veins of young leaves. 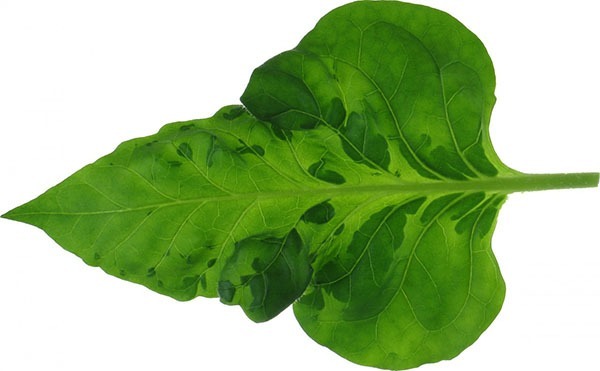 This is followed quickly by the development of a mosaic or mottled pattern of light and dark green areas in the leaves. These appear as thick elevated, blister-like areas. In these cases, large dead areas develop in the leaves. The plant growth is stunned and there is downward curling and distortion of leaves. The leaves may become narrow and elongated. These symptoms develop quickly and are more pronounced on younger leaves. Mosaic does not result in plant death but if infection occurs early in the season, plants are stunted. Lower leaves are subjected to “mosaic burn” especially during periods of hot and dry weathers. This constitutes one of the most destructive phases of tobacco mosaic virus infection. Infected leaves may be crinkled, puckered, or elongated, however if TMV infects crops like grape and apple, it is almost symptom-less. TMV survives in infected leave and stalks in the soil or on the surfaces of contaminated seeds. The virus initially enters a plant through wounded tissues of seedlings or transplants in the fields. Then it spreads in the field. The infection is systemic invading the parenchyma cells and moving through phloem. TMV is transmitted readily through mechanical sap, grafting and dodder. The most common method of transmission of TMV in field and greenhouse is through hands of workers handling infected and healthy plants. It enters the neighboring cells through plasmodesmata. It can also spread through phloem for longer distance movement within the plant. Moreover, TMV can be transmitted from one plant to another by direct contact. Following entry into its host via mechanical inoculation. TMV un-coats itself to release its viral RNA strand. Then the viral genome will further replicate to produce multiple mRNAs. The resulting mRNAs encode several proteins, including the coat protein and an RNA-dependent RNA polymerase (RdRp) as well as the movement protein. Thus, TMV can replicate its own genome. 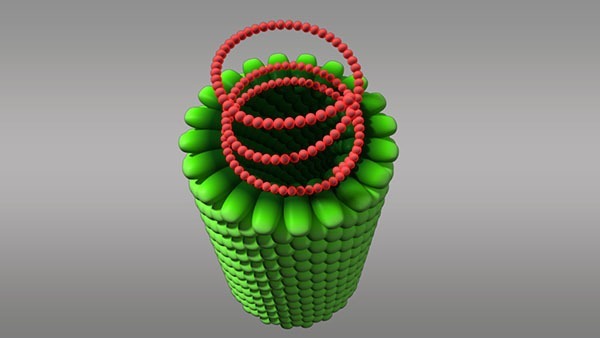 After the coat protein and RNA genome of TMV have been synthesized, they spontaneously assemble into complete TMV virions. The sanitation is the main method of disease control. The crop should not be grown at least for two years in the fields where diseased crop was grown. Removal of diseased plants and weeds that harbor virus early in the season also helps in reduction and elimination of subsequent spread of virus. Workers in the field must wash their hands with 3% trisodium phosphate or soap. TMV resistant varieties of tobacco may be grown. Coconut milk is found to be effective in the control of TMV.